Dimensions H x W x D 418mm/16.5" x 238mm/9.4" x 351mm/13.8"
If you have not yet heard of B&W, then perhaps, you have joined this hobby in the last few weeks...and a hearty welcome to you. They have been a stalwart of the industry since 1966, for more information on the company visit their website (linked above). I would say that B&W is certainly one of those companies that strongly believes in pushing the technology envelope in their products, and relentlessly pursues incorporating new materials and design features. I am not convinced the pursuit of bleeding edge technology is in of itself a good or bad thing. On the one hand; a scientific approach combined with innovation and the use of technology is what results in real progress in the long run, and on the other hand the misguided pursuit of technology can result in over-engineered and needlessly expensive product. The real test comes in the listening...hold on, we're almost there. One of the downsides of companies that do heavily use innovation and technology, is that they tend to overdo the use of fancy-sounding proprietary names for the features of their products - ad nauseum in many cases. I cannot say B&W is the worst offender in this regard, but they certainly register on the scale. Judge for yourself, in this model alone they tout the following features "Balanced drive", "Tweeter on top", "Matrix", "Tapered tubes" and "Flowport". I am not going to regurgitate their verbage; again, for a first hand view visit their website. It must be a British thing, but these guys really know how to ring my bell when it comes to aesthetics. Products from NAD, Monitor Audio (previous management), Quad, KEF, Tannoy, Rotel...all have that understated, clean lines, flawless finish look. In my books, the 805S is among the sexiest speakers ever - not quite over designed like some of the Italian stuff and not pedestrian looking like a lot of American gear. If you are as enamoured with its looks as I am, you may want to consider the purpose built stands for an extra $300USD. If the looks of British audio gear puts a smile on my face, then the two sets of speaker inputs does turn that smile upside down. I hate to think of the wasted resources and consumers shelling out that bit extra for this fallacious audiophilia; when one set of binding posts would do the job just fine. Ideally, speaker manufacturers would provide a facility whereby the consumer could fasten bare cable directly to the crossover or driver. Saving cost and eliminating the two connections and bit of wire from the binding posts to the destination within the box. Conformite Europeenne be damned! Sorry, I'll get off my soapbox now. Initial impressions were excellent. Bass response was tight and extended, instruments were spaciously placed with a solid and stable image and sound seemed to project effortlessly. However, on more extended listening the treble was a bit fatiguing at times. But, inital impressions being what they are, I was curious on how it would fare in the real test...a direct comparison with other speakers. As always, the tests detailed below are representative of what was generally experienced over many listening sessions. Comparisons were done by repeatedly listening to a very short passage and switching between candidates. Volumes levels were level-matched as best I could with out the benefit of laboratory grade equipment and facilities (donations of such would be greatly appreciated). 805S vs. Dynaudio Contour 1.3 MkII This represents a fairly meaningful comparison; since the Dynaudio when last sold retailed for $2400 USD which places it in direct competion with the 805S and its predecessors. The results were a close finish. But in the end I would have to nod in favour of the Dynaudios in light of their slightly better performance on dynamics and transients. The other aspect where I preferred the Dynaudios was in the presentation of treble frequencies. Intially, the 805S may seem very detailed (especially at lower volumes), but over extended listening (and especially at higher volumes) the treble became a bit fatiguing if not tizzy sounding. There was no question whatsoever, bass extension was much deeper on the Dynaudio, more than you would expect just from reading the specs of each unit. The Dynaudio's projection was also relatively "free-of-box", whereas only in comparison did it seem like the sound emanated directly from within the cabinet of the 805S. As with the above test, it felt like the Dynaudio was able to project sound from a space independent from the cabinet. Here once again the Dynaudio reproduced a sound relatively less constrained by the box, and seemed to better execute dynamic passages and transients. Initially, the 805 seemed a bit smoother, but on deeper inspection I realized that it was the more dynamic presentation of the Dynaudios that was at the root of my perception. The Dynaudio again handled transients and dynamics with such ease that the presentation seemed a bit more natural than with the 805S. It is important to reiterate that all the difference above were very small in magnitude, and required a lot of repetition and effort to discern. Having said that, I can assuredly say that I would prefer the Dynaudio for the slight edge in performance. 805S vs. Jupiter Audio Europa Though the previously reviewed Jupiter sells for a little over half what the 805S costs, a direct comparison helps establish where in the landscape the B&W falls. I did not hear any appreciable difference on this track (What! Cannot hear a difference? What kind of a poppycock reviewer is this guy?). The 805S had more weight and punch on piano transients in the low and mid frequencies. However, the treble range did sound more open and natural on the Jupiters. In contrast, reproduction of the higher frequencies did have a bit of a bite on the 805S. There was no question, the 805S had a much deeper and somewhat tighter bass response. The differences on this track seemed smaller in scale than on any of the previous tests. Except, on one measure the Jupiter Audio eked out ahead - the treble response on the 805S was delivered "free in space" and unencumbered by surrounding structure but the mid/bass frequencies did seem relatively constrained by the cabinet; whereas the Jupiter Audio seemed much more unconstrained further down into the spectrum. 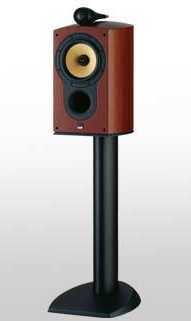 The 805S seemed relatively a bit boxy on male vocals, especially when compared the much more open sounding presentation on the Jupiter Audio units. But on the other hand the 805S were much more detailed and natural sounding, whereas the Jupiter Audios were relatively a bit less detailed and thin-sounding on male vocals. This is a track I use to test for female vocals and low level detail. The results were virtually identical to the "Cheek to cheek" test above, except here the vocals were female and not male. There was no question the bass response on the 805S was more extended and tighter sounding. Also, and the drivers on the 805S sounded like they were a bit better integrated than on the Jupiters. In both speakers the treble presentation was wonderfully detailed and free in space, it was just more so with the Jupiters. However, the 805S did get a bit fatiguing over time, especially at higher volumes. In the bass regions, the 805S proved superior with better extension and a tighter response. In the midrange there wasn't a clear winner, they each had their relative strengths and weaknesses. Considering the Jupiters sell for nearly half that of the 805S, I cannot give the B&Ws very high marks on value for money. The B&Ws have a very appealing sound when you first listen to them. They decidedly command entry into the "high-end" club. There is a great amount of detail (especially in the treble), tight and extended bass response and not too shabby a mid-range presentation. The tweeter-on-top also helps with a very exciting soundstage. And the looks really close the sale. Upon deeper inspection, the treble response can be fatiguing and the rest of the performance (while impressive in absolute terms) does not keep up with the relative price points of the competition. It has the high-end looks, but falls just a bit short on the things that really matter (I think I dated some girls like that in my youth).